At the moment, the future of cancer research seems to be centered in the field of targeted chemotherapy. However, it is evident that currently neither conventional nor targeted chemotherapies will suffice against resilient tumors. 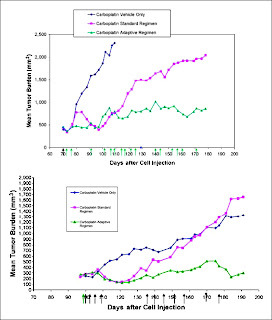 Conventional therapies generally aim for maximum cell death in the shortest amount of time using fixed regimens of drugs designed to eliminate as much of the tumor mass as possible under tolerable levels of toxicity to the patient. However, our perception of cancer has begun to change. It is becoming increasingly evident that an individual's cancer can be viewed as a Darwinian ecosystem containing a heterogeneous mixture of genetically distinct cancer cell types that compete amongst each other for space and resources. This competition, combined with conditions within the tumor micro-environment and cancer phenotypes conducive to increased DNA damage, stimulate the rapid evolution of tumor lineages. Unfortunately, this often renders current therapies ineffective against highly adaptable cancers that quickly develop resistant cell types. Adaptive Therapy, a relatively new field of cancer treatment, has the potential to counteract cancer's ability to adapt. A recent study published in the American Association for Cancer Research Journal attempts to assess the potential of Adaptive therapy in comparison to conventional methods. The two strategies against which adaptive therapy is compared, high dose density therapy and metronomic therapies, are two of the most common strategies in conventional chemotherapy. High dose density treatment is designed to quickly destroy as much of the tumor as possible in the shortest amount of time, while metronomic strategies administer lower, more frequent doses to limit patient toxicity. 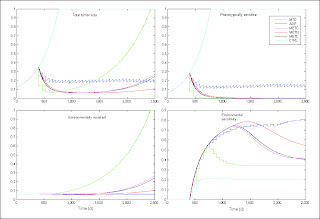 The study uses a series of mathematical models and computer simulations followed by in vivo experiments using mice to comparatively assess the survival rates achievable through these strategies. 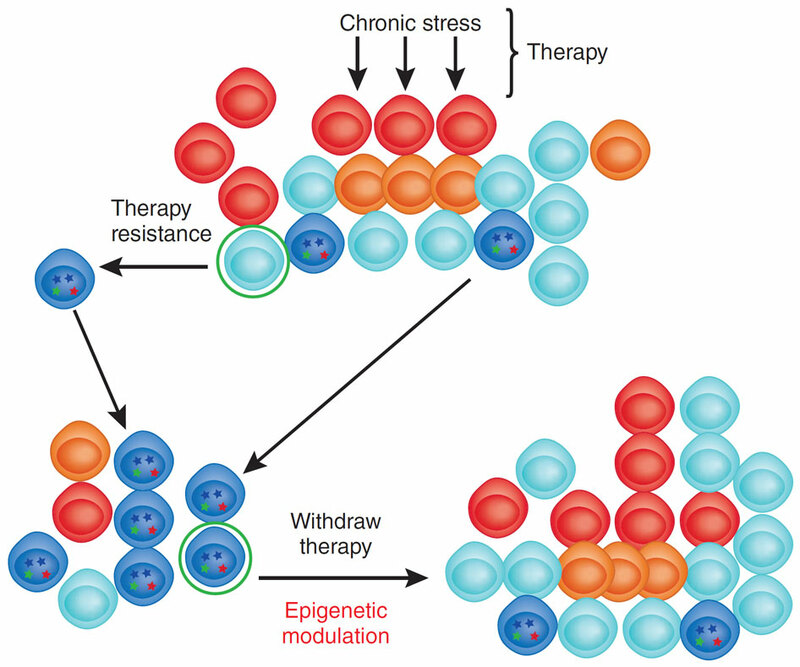 Within each experimental parameter, the researchers divided the samples into three groups under different regimens of therapy: a control with no treatment, a group under conventional therapy regimens, and an adaptive therapy group. By comprehensively comparing the survival rate and tumor burden theoretically and in vivo, the study definitively shows relative efficacy of adaptive therapy to prolong survival and minimize tumor burden. In the models as well as in vivo experiments it was found that both high density dose treatment and metronomics produced tumor microenvironments with reduced inhibitory pressures on resistant cells. 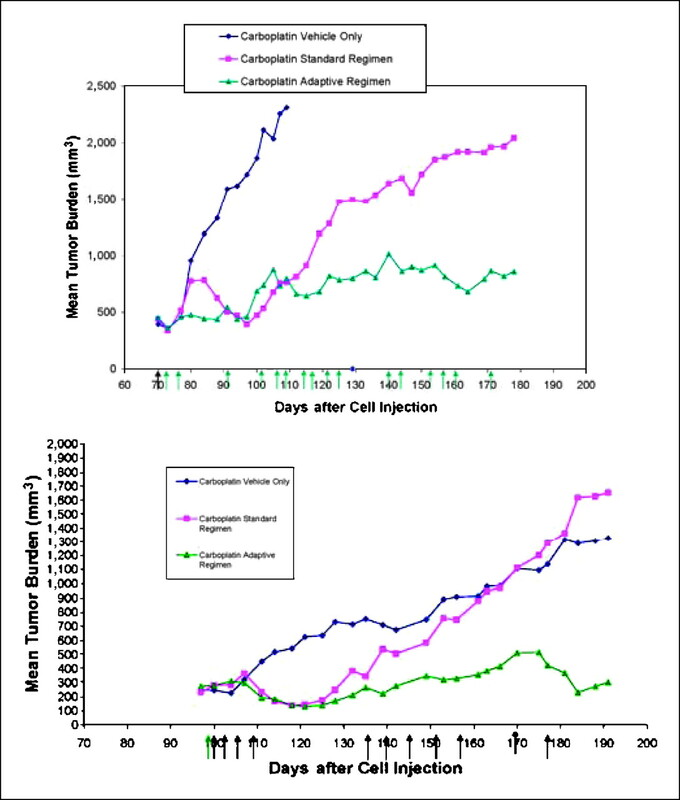 This resulted in increased proliferation of chemoresistant lineages, decreased survival, and increased drug induced toxicity as well as tumor burden. 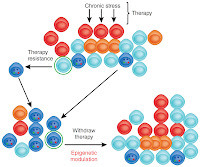 The control group showed unsuppressed proliferation of the more fit chemosensitive cells, which in turn diminished the population of resistant lines. In contrast, the adaptive method showed greatly increased mean survival and decreased tumor burden. This is the first in vivo study of an adaptive approach, and the authors admit that there were limitations to the experimental design. An ideal adaptive technique would control more than just the timing and dosage of a single drug. However, despite its limitations, this study illuminates the flaws in current strategies and shows that a viable adaptive approach is possible. In addition, it was found unexpectedly that control of the tumor could be achieved using decreasing doses over increasingly long intervals, adding to the attractiveness of adaptive therapy. While this method departs from the traditional paradigm of killing the maximum number of tumor cells, it may be that an effective adaptive approach could make the idea of an overall cure for certain cancers obsolete. At the very least, this could be a promising solution to prolong patient longevity in lieu of an effective method of eliminating tumors altogether.